Jurassic Knife: This knife blade is made from Mexican Peacock Obsidian. 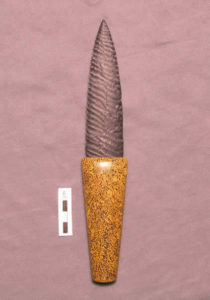 The handle is made from agatized dinosaur bone from S.E. Utah. Jurassic Knife: This knife blade is made of Dacite from Northern California. 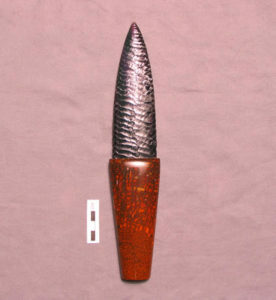 The handle is made from agatized dinosaur bone from S.E. Utah. Jurassic Miniature: This knife blade is made of Paiute Chalcedony from Nevada. 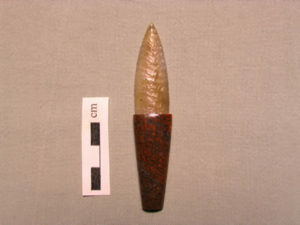 The handle is made of agatized dinosaur bone from S. E. Utah.